about this time of year i get "the itch". the halloween goodies start coming out of storage and road trips for pumpkins, rosehips and sumac berries are high on the "things to do" list. that "nip" in the air and the crunch of leaves remind me that fall bulbs need to be set in soon. -and the signs of thanksgiving and christmas will soon follow. one fun thing i did over the summer was take a working weekend jaunt to mt. vernon ohio. the "from our hands" wholesale show put together by sharon andrews & lori baker, one of several shows yearly, that they organize. what wonderfully talented folks took part! i had lots of fun helping out in the fried green tomatoes booth, and got to see first hand the frenzy that surrounds this type of show! goodness me. in other news ~ if you get the country register newspaper for WV & PA you'll notice i had the opportunity to do a few illustrations and ads for them in the september 99 issue. on the pattern front: for those who like both tricks & treats i have two new autumn patterns out that you may have seen by the by. 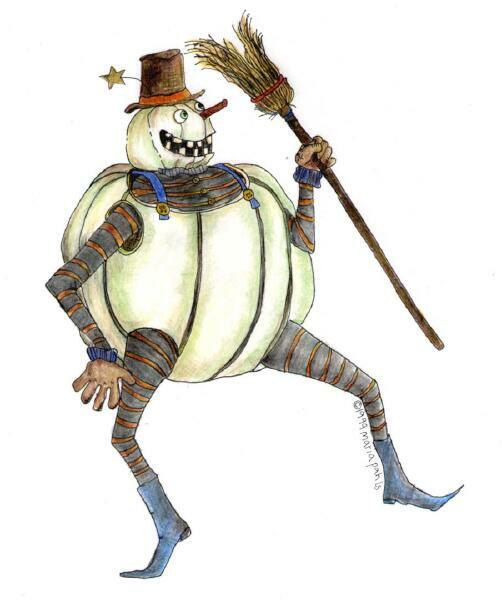 one is grumpkin the pumpkin head - a trickster of a goblin that has many great techniques. and for those who prefer "sweet" there is dear penny pumpkin, a rag stuffed pumpkin head girl, that will make you forget all about the candy bowl! she is part of a new series i am calling "prairie rags". as i have time i will release the rest of the "family" in pattern form. many of you know that i also have a limited supply of finished items for purchase. you can request the list at any time complete with all the particulars about the goodies i have to offer. and check back for a winter pattern release too! for the time being the newsletter will be done on a seasonal basis right here on the web site. the next issue will be at the beginning of the year in 2000! i hope to get on a roll and have 4 issues per year here at the homespun peddler site. in the past i've relied on membership, to finance the interviews and the extras, but paperwork and the shear effort of putting out a publication every two weeks was just too overwhelming for me! you can still pledge your support to keep the newsletter going in a few ways...obviously buying my patterns and finished works is a great means of support -OR- if those are not your fancy, then send in tidbits such as resources, volunteer to do an interview or show us a great technique. maybe you know someone who would be great to interview...you can even help the news letter by telling two friends about it and asking them to tell two friends in turn etc...it is only by your support that a publication such as this is possible. you'll notice too that some changes in the format have taken place,this is because of the seasonal nature of the newsletter. well thanks for visitin', have a wonderful autumn and a joyous winter! p.s. if you find any "dead links" in the newsletter or back issues please report them directly to me at seedpod@fuse.net. a dead link is a url web address to a company that is no longer active. a drawing for a small prize will be held monthly for those that have accurately reported dead links. send me the url for the newsletter page on which the dead link was found & the company or shop name. winds that whisper autumn slumber. in most cases a clear reflection from an old mirror may be more desirable than a dull streaked one. flea market relics are prime candidates for restoration and can be rejuvenated with a process known as resilvering. when scouting out potential mirrors clean the glass and look for scratches and abrasions on the surface. because the process doesn't improve the surface glass, mirrors that show considerable damage should not be resilvered. black spots may be chips in the glass. deterioration of the old silver, in rare cases, causes permanent staining on the glass. this only shows up after resilvering. flat square mirrors are cheaper to replace than to resilver. those with designs painted between the glass and silvering will result in a loss of the painting if resilvered. cut glass can be resilvered. old glass is brittle and can have stress built up in it, so it's possible that it can break for no apparent reason. the method of silvering old and new mirrors uses silver nitrate and has since 1835. prior to that mercury was used. since this is extremely toxic do not attempt to resilver a mercury mirror. other poor candidates include german plate (a thin glass with a concave bevel), telescope, camera, and antique car headlight. in most cases, resilvering increases the value of an antique mirror. for mirrors that are really old or an important designer's piece check with an appraiser first before resilvering. it is also important to note that mirrors of the eighteen hundreds decrease in value if non traditional techniques are used and are likely to contain mercury. for more information on mirror resilvering, check out the online book "mirror resilvering a how-to guide for the antique restoration craftsman"
to determine the "old from the new" in papier mache halloween lanterns, "Antiques" magazine (see resources under Country Home) suggests using a long-wave black light. when the light is shined on any unpainted surface or a scratch the paper used in new lanterns fluoresces bright white; vintage pieces do NOT. keep in mind that a dishonest seller may deliberately alter the reproductions or remove paper inserts to mislead buyers. seed pod note: black light is also useful to detect repair in porcelian figurines, glued areas will usually show up under a black light. dating ratchets (clanking- spinning noise makers) you can help identify the time it was made by the handle. ratchets from pre-1960 have a wooden handle and post-1960 are found with plastic handle. for an easy quick way to make a really primitive doll head, annie moon suggests using osnaburg fabric that has been washed and dried. once the head is stuffed, and any sculpting of nose, lips, etc. is done ... paint the head and neck with white acrylic. once dry, start painting with black, brunt umber, or any dark color of your choice. as soon as the head is covered immediately begin washing off the dark paint with water using a scrubbing motion. continue using the dirty paint water to wipe off the paint until desired results are achieved. ALL THAT GLIMMERS IS NOT GOLD . . . THIS TIP'S THE CUTTING EDGE IM TOLD! for a wonderful festive look - hunt down round metal vegetable/cheese graters at flea markets. if used as a decorative lamp shade over a votive candle, the holes of varied sizes around sparkle from the candle light. (never leave a burning candle unattended) ~ from my flea market pal laura richards. for LIVE potted root ball christmas trees use hair spray on the needles to lock in moisture while indoors. the spray will wash off with rain when placed outdoors and should not harm the tree. you can also FIX your uncarved pumpkin with artist's spray fixative. a thin coating helps *uncarved* pumpkins stay fresher. rusty? a flea market dealer told me that for rust on an old lunch box i bought i should try one of the name brand "soft skin" type bug repellants. he said the stuff works miracles for cleaning up most anything especially light rust. the september issue of country home:country gardens suggests using a few teaspoons of cornmeal sprinkled on freshly washed hands . massage the powder into the skin to remove embedded dirt and rinse well with warm water. christmas traditions- carries many lines of holiday goodies and can get most any debbee thiebault pieces you might want! "Play With Your Pumpkins "
"Play With Your Food "
"Country Living Handmade Christmas : Decorating Your Tree and Home"
This title is out of print ask for it at your local library. *flowers & plant make excellent gifts year round. also contains info on having a "green holiday" including details of potted christmas trees, twig trees & topiary tress. the featured artist in the Oct./Nov issue of Mary Engelbreit's Home Companion is Debbee Thibault. the article will have 4-5 color pages of her work. contents include a ready to use head made by shari(with glue and fragile crackle) . 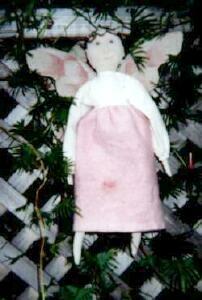 dollskin , complete body & painting instructions & supplies list. you provide your own modeling paste, gesso, Dap, or paints. the cost of $50.00 includes shipping. send $3 to cover postage in u.s.a. $4for mailing to canada. 3621 Lindberg way (dept PPNL), weirton wv 26062 each edition contains listings of happenings,articles of interest as well as a complete listing of country register papers around the country. making casting molds instructional video available from rag doll daze's penny dehoff. a professionally filmed video of Kirk Hindman Senior Designer a major toy manufacturer. kirk demonstrates a mold making process for casting. 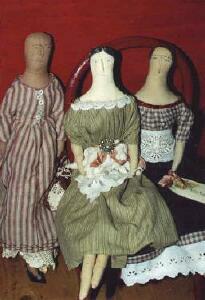 this could be useful for many types of doll-making & crafting. in addition a source list for supplies is given. at the Dan Emmet house hotel/convention ctr. not only is this term used to describe a lantern made from a hollowed out pumpkin with a carved face, but also describes "ignis fatuus" (also called marsh lights and Will-o-the-wisp). this is a phosphorescent light that hovers or flits over swampy ground at night caused as a result of gasses formed from decaying organic matter. much like a frying pan this cooking utensil had a shorter handle and three legs which allowed it to set over the coals; frying pans of the day had much longer handles so that the cook would not have to lean into the fire to tend the cooking. where we now use bed springs,in the past-ropes were used. if the ropes were not tight enough, the sleeper would not be comfortable. a small,thin, round rubber piece used atop stubborn jar lids to apply a "grip" when opening (instead of asking your "husband" to help). 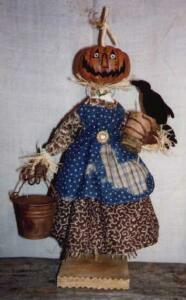 "halloween" means "hallowed evening" because it takes place before all saints' day. many countries have their own traditions and these have been modified by different cultures over time. the origin of jack-o-lanterns, it's said by an irish tale, is that a man named jack could not enter heaven because he was a miser and could not enter hell because he played practical jokes on the devil. he was left to walk the earth with his lantern made from a hot coal placed in a hollowed-out turnip. in canadian halloween tradition, scottish and irish immigrants of the 1800's used pumpkin as jack-o-lanterns instead of turnips in their celebrations. the druids,an order of priests that believed spirits, witches and elves came out are credited for the these symbols in halloween lore. cats that were once human beings but had been changed as punishment for their evil deeds. a summer's end festival called "samhain" was the druid celebration of the summer harvest. decoration during this time included pumpkins, leaves, and cornstalks. trick or treating (begging)originated with "souling", where people visited homes and offered prayers for the dead in return for gifts of food. 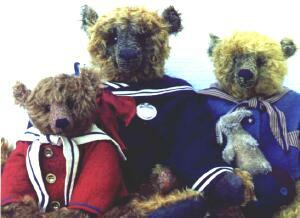 Pat Murphy began making bears sometime around 1984. 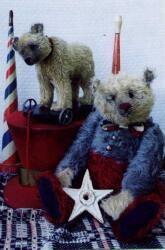 During her antiquing excursions she found herself drawn to the tattered old bears. The extremely high prices that accompanied heirloom bears convinced Pat to try her hand at making her own. 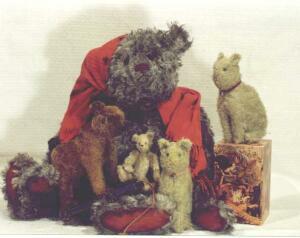 With the mohair lining of an old coat, Pat stayed up to 3 A..M. making her first teddy bear. The next day her newly made friend was the talk of her office mates. Since parting with the first bear was not an option Pat found herself taking a request to make a second bear for a fellow employee. Special orders for co-workers and friends kept her busy and gave her the momentum to become involved in the craft show circuit for about seven years. To supply her fabric, Pat scoured thrift shops picking up old coats with the mohair and alpaca lining for a few dollars each. Five years of bear making, and two washing machines later, Pat came across a mail order source for mohair. She admits that making the first cut into the $70 per yard fabric was a little intimidating! Murphy soon became adept at using the new mohair and even developed several processes for dying and aging the fabric on her completed bears - or "mucking them up" as she called it- because it "looked too new". With expensive nature of her supplies, making a $30 bear was now impossible, Pat needed to leave the craft shows and begin participating in teddy bear shows. Though she missed the diversity of the craft shows, taking part in the teddy bear shows was a wise move. Since leaving her office job six years ago, Pat has been featured in various publications and was included on an international teddy bear maker tour of Holland, Belgium, and Germany. Her husband, Tom, recently joined the business. (He developed a pattern for the "griffin" bear on wheels which thrilled Pat since she is a collector of wheeled animals.) 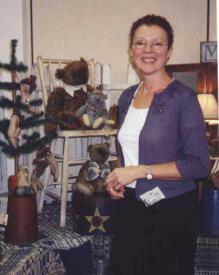 Daughter Jen, who accompanied her mother to shows since the age of six, is also a bear maker. Jen makes other animals too, and all of her creations are under 12"! As for the future Pat hopes to take part in more shows like "From Our Hands" which host a varied group of artists. An avid antique and heirloom clothing buff, Pat enjoys giving vintage fabrics, trims and buttons a "second life" as she once did with the discarded coats. Her bear line is always changing though she does a few limited edition series, one of a kinds tend to be favored. (She makes sweet kittens too that are my personal favorite!) Pat is also a gifted photographer and enjoys photography almost as much as bears and collecting. She echoed the words of so many talented artists that i have been privileged to meet- that being paid to do what you love is a wonderful thing. "Bear making has taken me to many wonderful places and I've met so many wonderful people". 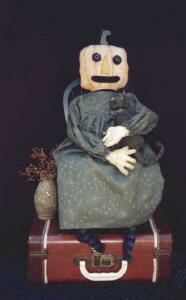 "penny pumpkin and putty cat"
© copyright 1999 maria pahls~the seed pod all rights reserved. no part of this newsletter may be reproduced without written permission from the publisher, except by a reviewer who may quote brief passages in a review with appropriate credits; nor may any part of this newsletter be reproduced, stored in a retrieval system, or transmitted in any form or by any means -- electronic, mechanical, photo- copying, recording, or other -- without written permission from the publisher. photographs posted on homespun peddler site by permission of photographers and are protected under this copyright.